"Feigel Fables first appeared in Surfguide Magazine in 1964 and enjoyed a large cult following. According to some of these loyal readers, Rip Van Nerdwinkle foretold the ‘Shortboard Revolution’ and the changes in surfing attitudes that followed." 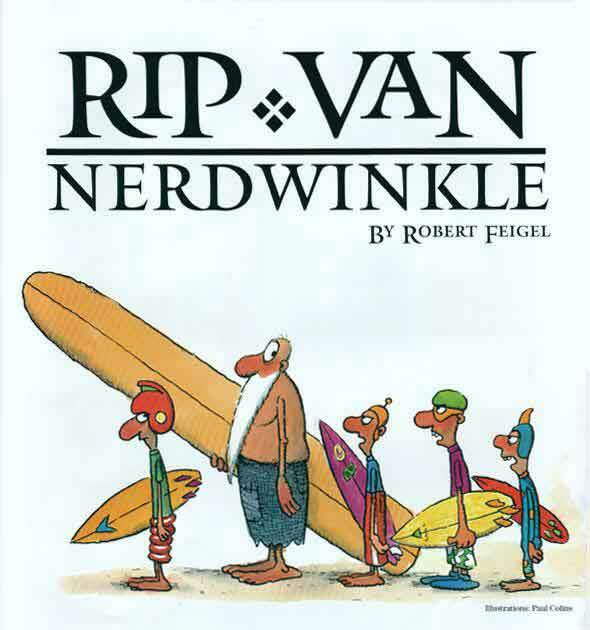 - introduction from the 1999 Pacific Longboarder reprint of Rip Van Nerdwinkle (Volume 3, Number 3 - illustration by Paul Collins). The original was published in the November 1964 issue of Surfguide Magazine. Once upon a time on the Island of Nerd, where everyone surfs, there was a once upon a time when very few people surfed. It was during these joyous early times that a stout little fellow named Rip Van Nerdwinkle rode his surfboard and cavorted happily in the Nerdian surf. Rip bore the proud distinction of being Nerd’s first and finest surfboard rider. Each day he drove down to one of the nearby surfing beaches like Waitansee, Sand Nonofree, or Ubilam (hold the last word up to a mirror and see how cleverly we disguised the real beach . . . in fact, hold this story up to a mirror and see if the whole darned thing doesn’t make more sense that way) and he’d surf his huge, splintery redwood plank all the way to the beach every time. On weekends there were other people in the water, and they all knew each other. They shouted and laughed as they rode the waves to shore, and they talked between sets. When the waves came they took turns and never — NEVER — got in each other’s way. Rip and the other surfers always had fun. Each evening, just before sunset, Rip would drive his station wagon up a deserted road and he’d climb way up to his secret spot high above the ocean. 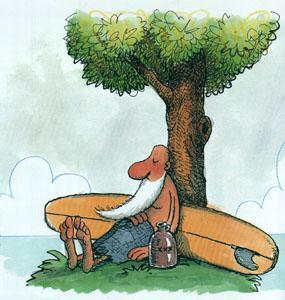 He would prop himself against an old tree where he could see the swells, and he would plan his next day’s surfing. One night he brought along with him a bottle of home brew to keep him company. As he sat and watched and planned and took a nip or two, his head began to nod and soon he was aslumber. Rip’s half-empty bottle slipped from his hands unnoticed. Forty years later, Rip woke up, and it didn't take him long to realize that something was amiss. He stood up and stretched — he was very stiff. He looked down and saw he was very fat. He scratched his head, and found he was quite bald. And he stroked his chin and found he had a very, very long beard. Almost as if by instinct his eyes scanned across the sea, checking the swells. Then he climbed down to his car and drove off toward his favorite beach. Out in the water very few surfers talked to each other. And nobody laughed. All eyes were on the horizon and when a set came everyone paddled like mad. “Hey, Gramps ... watch where ya going”, one especially pushy surfer snarled as he thrust poor Rip aside and paddled into a wave in front of everyone else. Rip parked his station wagon on the deserted road and once again climbed, with difficulty, to his secret spot. As he sat and watched and planned, and drank, he fell asleep. The empty bottle fell from his hands. And a tear trickled down his cheek, unnoticed. * I haven't included Proxylox and the Three Bagels because when it was published, it was missing two paragraphs. The original draft is long lost, I can't remember what the missing paragraphs contained and I've never felt the fable makes much sense without them.